When you grow cherry tomatoes, you get a bargain for the space you must a lot them. Yes, they are rambunctious and prone to wandering about. But staying on top of the prodigious output of a cherry variety — a close descendant of the wild cherry native to the roadways, fields and forest edges of South America — is a summer feat without the famine. This recipes does cherry tomatoes justice, taking full advantage of the characteristic sweetness inherent in the fruit while providing a colorful and flavor-packed condiment, which you can play with by adding hot peppers and/or sliced lemons. And of course, you can always sub out regular tomatoes, just cut them into smallish chunks. 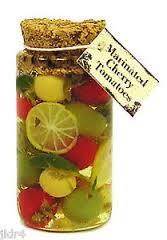 Fill an attractive jar with the marinated tomatoes and make a gift of it. If you keep yours in the refrigerator — recommended — you’ll have to bring the tomatoes to room temperature before using as the olive oil congeals with the cold to a butter-like consistency. The original recipe comes from Southern Living. Adrienne demoed this at the US Botanic Garden in August 2015. Put grape tomatoes in a large non-reactive bowl, sprinkle with the salt and toss gently with your hands; let stand 30 minutes. Meanwhile, sauté shallot and garlic in hot oil in a medium saucepan over medium heat until vegetables are translucent but not brown, about 3 minutes. Remove from heat, and stir in thyme. Cool completely. Toss together vinegar, next 3 ingredients, tomato mixture, and shallot mixture. Serve, or cover and refrigerate up to 4 weeks. Serve over grilled fish, meat or vegetables; atop crackers and cheese; add to salads. This entry was posted in Appetizers, Gluten Free, Recipes from Adrienne's pantry, Salads, Sides, Vegetarian and tagged basil, garlic, Shallots, thyme, tomaotes. Bookmark the permalink.